The Samsung Galaxy S III was revealed in London and at CTIA, let’s review what the reviewers have said about the new reigning king of smartphones which some are calling the iPhone of the Android crowd. Best-Reviewed Features: Gorgeous 4.8″ Super AMOLED touchscreen, new voice features, faster processor, Android 4.0 ICS, new camera tricks and nifty new software. Least-Liked Features: Plastic “vanilla” case, size may be too large and pricing/carriers not set yet. Estimated Rating: 4.33 out of 5. The Wired Gadget Lab called the Samsung Galaxy S III design vanilla while the features are innovative. The pop-up window to view video and phone features at the same time was smooth and a testament to fast quad-core processor. Facial recognition unlock and camera apps are slick. 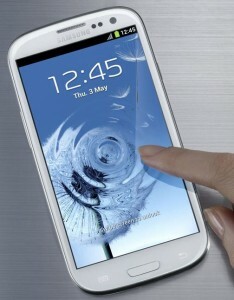 CNET’s Jessica Dolcourt found the design of the Samsung Galaxy S III to be compelling with an appealing touchscreen and nice feel in the hand. She called it a worthy upgrade to the Samsung Galaxy S II in every way and looks forward to using it in the summer when it comes in a world tour. The Samsung Galaxy S III looked very good indeed to Pocket-Lint. Although heavier than the Samsung Galaxy S II due to a clear 306PPI 4.8 inch HD Super AMOLED touchscreen, it’s still thin and looks better than an iPhone 4S retina screen. There’s a solid home button and the smart screen that doesn’t dim while you are looking at is called a stand-out feature as well as Direct Call. The S Voice wake-up feature is secure and most voice functions work very well. because of the thin bevel the screen feels even bigger than 4.8 inches. The only thing not liked is the plastic feel which keeps it light. It should make iPhone 4S fans sick with envy. The Samsung Galaxy S III was called a step up over its predecessor for being faster, bigger, cleverer and an excellent upgrade to the Samsung Galaxy S II. The Inquirer noted that the screen is lovely to look at, the processor is very fast and a brilliant phone. It does however feel cheap due to its dated plastic case. CNET’s Scott Webster wrote after viewing the launch event, that the Samsung Galaxy S III was worth the wait for incredible specs, Samsung software additions, especially Direct Call and Android 4.0 ICS. The price has not been set in the U.S. and U.K. plans are too hard to calculate cost, which for non-subsidized models is as hight as £500 upfront. The nice thing about the Samsung Galaxy S III being used as part of the Olympics, athletes, we will be able to learn from Olympians how well the phone works. If you look at the Samsung Galaxy S III sign-up page it shows the choice of carriers to be Verizon, AT&T, Sprint, T-Mobile, MetroPCS, US Cellular, and C Spire. When Samsung did this in the past with the Samsung Galaxy S II the carriers were correct but the drop down menus of carriers was not correct for Samsung Galaxy Nexus. We do know that the Samsung Galaxy S III will be coming to U.S. because the U.S. PR reps sent us confirmation of a summer release date which may be in time for the Summer Olympics.